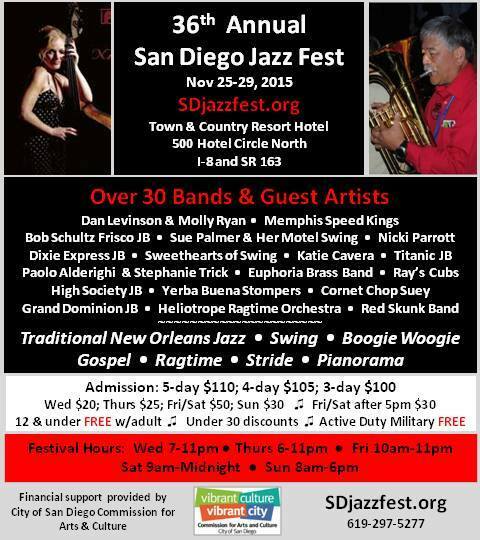 One of my friends recently asked me what I was doing for Thanksgiving, and I said, “I’m flying to San Diego for a wonderful jazz festival,” and this is why: the San Diego Jazz Fest (all schedules subject to change, but this is a filling menu indeed). The names you don’t see on the flyer above are Marc Caparone, Kim Cusack, Chris Dawson, Carl Sonny Leyland, Conal Fowkes, Kevin Dorn, Orange Kellin, Tom Bartlett, Duke Heitger, Leon Oakley, Clint Baker, Dawn Lambeth, and many others. I know that some of you will say, with good reason, “That’s too far away,” and I understand that. But if you say, “Oh, that’s just another California trad festival,” I hope you are not within swatting range, for it isn’t. But rather than take this uncharacteristic vehemence as merely the expression of the writer’s personality, look below. Evidence from November 30, 2014: a small-group session led by Ray Skjelbred, piano and vocal; Hal Smith, drums; Beau Sample, string bass; Katie Cavera, guitar; Jim Buchmann, clarinet and saxello, Marc Caparone, trumpet. I’ve posted other videos from this session, but here are the two that closed it. One lyrical, one steaming. The first song, ANYTIME, ANY DAY, ANYWHERE, which I associate with Lee Wiley — who recorded it a half-dozen times between 1950 and 1972. Wiley wrote the lyrics; Ned Washington and Victor Young the melody. I suspect that Ray knew it first from the Mills Brothers recording, but perhaps from the Chick Bullock, Ellington, Hackett, or Nat Cole sides, too. Here’s the festival’s home page and the relevant Facebook page. I hope you’ll heed the siren call of Good Music and join us there. Festivals need more than enthusiastic watchers-of-videos to survive. I hope I will be forgiven for ending on an autobiographical note. Five years ago, I had some cardiac excitement that was repaired by the best kind of Western medicine: open the patient up and put a little machine in. It works; I’m fine. Ask my electrocardiologist. But when I watch and listen to music at this level — music that I experienced then and have revisited often — I think, “Goodness, I could have died and never seen / heard this,” in a state of astonished gratitude. Not a bad place to be. Rather like the San Diego Jazz Fest. Every time I post some new videos of music by Ray Skjelbred and the Cubs they get an enthusiastic response . 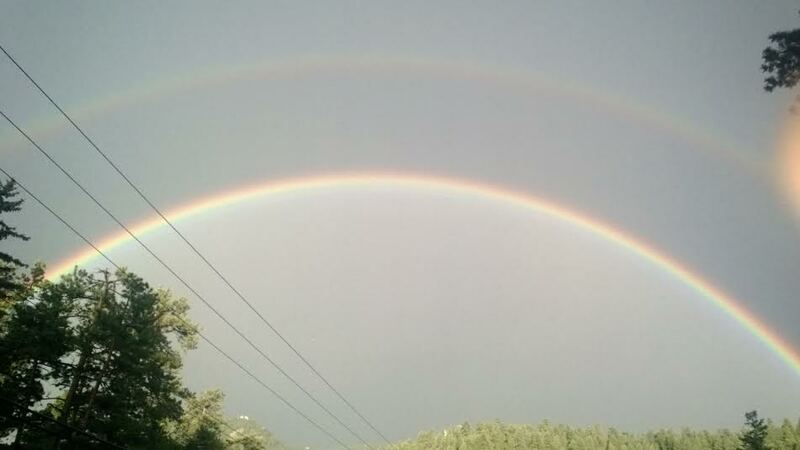 . . so here’s some more, recorded on July 13, 2014, as part of their Northern California tour. These performances happened thanks to the Napa Valley Dixieland Jazz Society (which met at Grant Hall in Yountville, California) — with dancers! The performers, the creators, are Ray, piano; Clint Baker, string bass; Kim Cusack, clarinet; Katie Cavera, guitar; Jeff Hamilton, drums. And they swing. The opportunities to hear James Dapogny’s Chicago Jazz Band at the July 2014 Evergreen Jazz Festival were delightful — a high point of the year for me. That band neatly balances thoughtful arrangements and solos, and the result is hot, sweet, eloquent, satisfying. They are James Dapogny, piano and arrangements; Jon-Erik Kellso, trumpet; Chris Smith, trombone, vocal; Kim Cusack, clarinet, alto saxophone, vocal; Russ Whitman, clarinet, tenor and baritone saxophone; Rod McDonald, guitar; Denver native Dean Ross, string bass; Pete Siers, drums. For those who might have missed the earlier posts in this happily extended series, here is the first part and here is the second. And here are five more delights. More to come — all equally rewarding. The city of Walnut Creek, California, has a rich history built on Native Americans, Mexican land grants, California walnut trees, cattle ranches, and an officially-classified Mediterranean climate. Today, one finds Charles Schwab and Barnes and Noble where walnut trees (left alone) would grow. I looked for gumbo, Creole ladies with flashing eyes, steamboats, and stopped, exhausted. But jazz — New Orleans and its kin — has a home at the Rossmoor Jazz Club, as you can see and hear here. On May 28, 2014, Clint Baker brought his New Orleans Jazz Band to that comfortable hall. They were Clint, trumpet, vocal; Jim Kilppert, trombone, vocal; Bill Carter, clarinet; Robert Young, piano, vocal; Bill Reinhart, banjo; Marty Eggers, string bass; Jeff Hamilton, drums. Here is the second half of the concert, for your delectation. I’ll see you at Rossmoor on July 10, 2014, when Ray Skjelbred and his Cubs perform there. This afternoon, I went on another thrift-shop quest: I search for several rewards, but predictably one is jazz records. 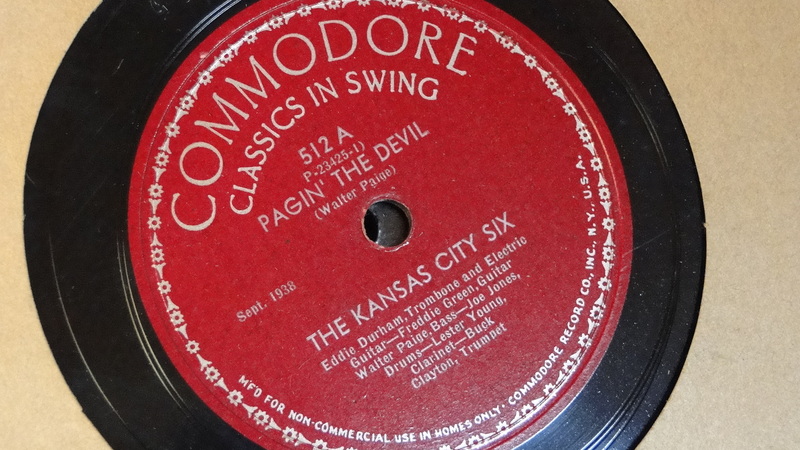 I am most keenly interested in 78s, although vinyl, CDs, home recordings, and cassettes have all surfaced recently. Just finding ten-inch 78 albums is a treat. 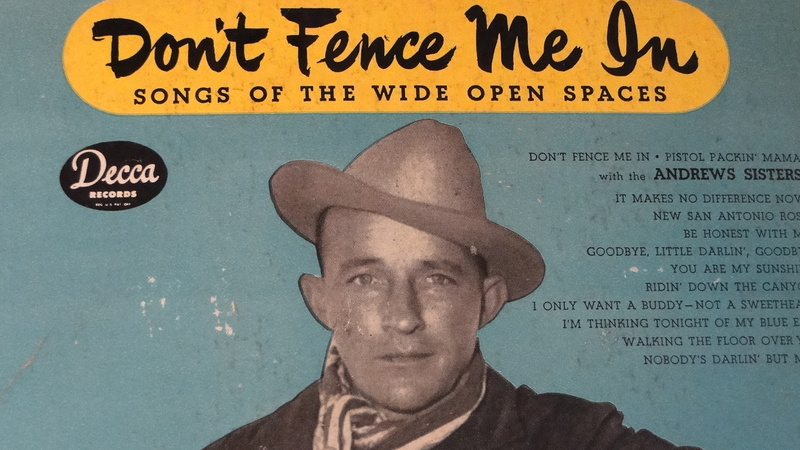 As an omen, it was hopeful in itself, although Bing albums are common: he sold millions of discs — this collection is copyright 1946. I love Mr. Crosby, although I gravitate towards his earlier work, when his gaze was more romantic, less severe. For a moment I mused upon the photograph of the man on the cover, clearly warning me not to trespass on his lands. At best, serious; at worst, unfriendly. Thanks to John Hammond and Milt Gabler, that’s a serious thing! I wasn’t moaning in the thrift store, because I knew the other patrons might find it odd, and I would have to stand up to properly explain that these discs were the jazz equivalent of first editions by prized writers. But JAZZ LIVES readers will understand my state of bliss. Two other Commodores (!) 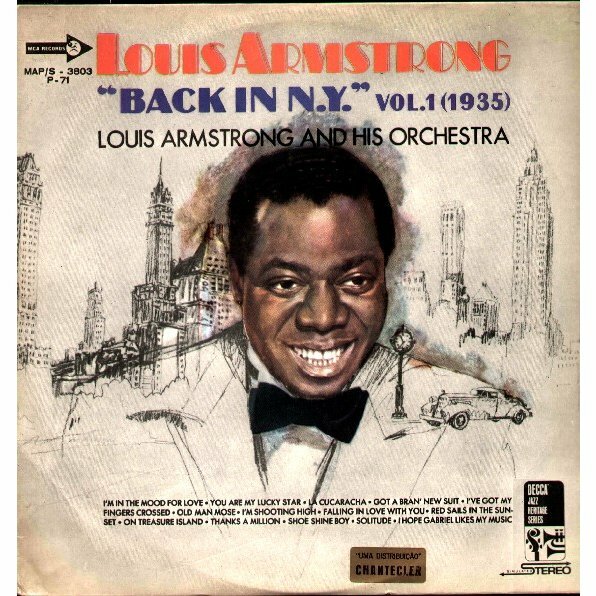 appeared — the whole of the 1944 Kansas City Six date with Bill Coleman, Lester Young, Dicky Wells, Joe Bushkin, John Simmons, Jo Jones: JO-JO, THREE LITTLE WORDS, FOUR O’CLOCK DRAG, I GOT RHYTHM. The other side is BLUE ‘N’ BOOGIE, Dexter Gordon credited. I don’t know the facts, and I shy away from melodrama: jazz-mad Patty or Bill secretly demolishing Mom and Dad’s square Crosby platters to have an album for Pres, Bird, Diz, and Babs. 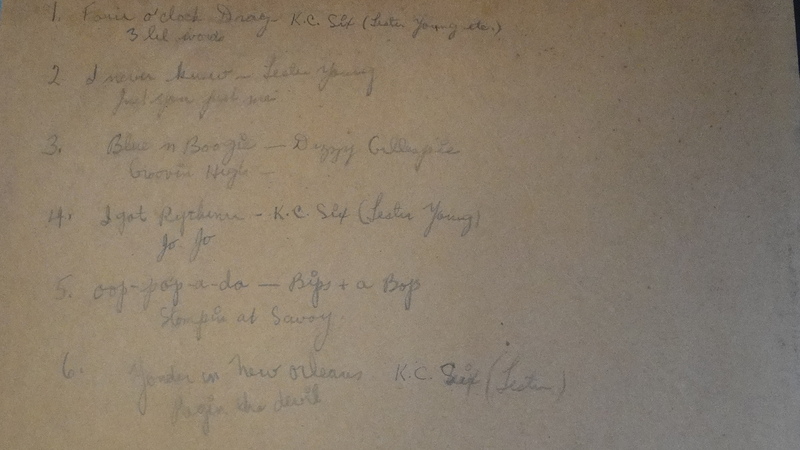 But this list is written with pride of ownership and pride of having a burgeoning Lester Young collection. I don’t think that with an album of only six pockets that one would have to write such a list to recall the contents: this tally says LOOK WHAT BEAUTY I HAVE HERE. That four of the discs on the list survived speaks to the owner’s care, and to the care of the person who delivered this package to Alphabet Soup. I always feel sad when I uncover such a beloved collection, because I worry that the owner has made the transition, but perhaps Grandma or Grandpa simply has the complete Lester on an iPhone? Did Bing and the Andrews Sisters give way to Pres, Bird, and Dizzy? I can’t say in this case. If you wish to write the narrative of seismic artistic shifts, I can’t prevent you from issuing essays on Modernism. Or academic exegeses of High and Low Art. But this assemblage — take it as if it were one of Joseph Cornell’s boxes — suggests to me that there was a moment in the bumpy history of “popular music” where Eddie Durham, the Andrews Sisters, “cowboy music,” Three Bips and a Bop, Cole Porter, Bird, Diz, Clyde Hart, all coexisted in relative serenity. Will those days when music roamed wide-open spaces return? Can we dream of creativity without fences established by the artists, their publicists, the critics, and business people? I don’t know, and the arguments this might provoke have a limited charm. 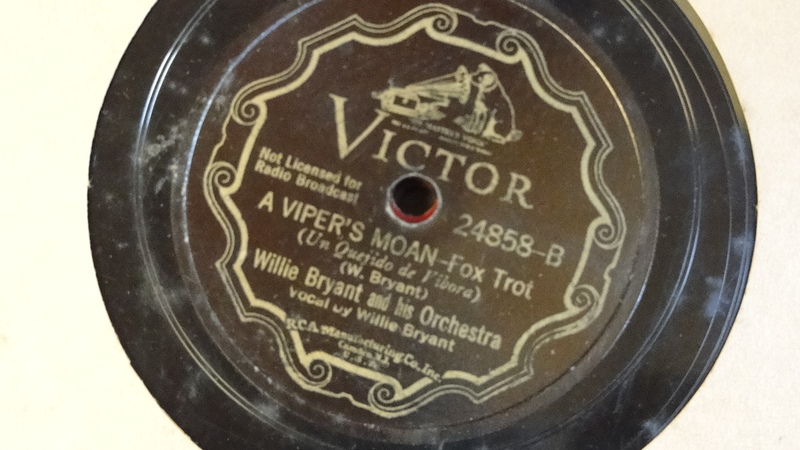 So if you pardon me, I’m off (across the room) to play my New Old 78s, much loved then and much treasured now. And those seventy-year old relics sound very good now, I assure you. Walter Page and Willie Bryant come through superbly, as do Lester, Jo, and Dexter. And listening to 78s is very good aerobic exercise for me: I have to get out of my chair every three minutes. Lester is watching over my health, or perhaps it is Bill Coleman or Milt Gabler? Blessings on you, oh Unnamed Lover of Jazz! This post is for three young tenor players — in alphabetical order — Jon Doyle, Ben Flood, and Stan Zenkov. They know why! 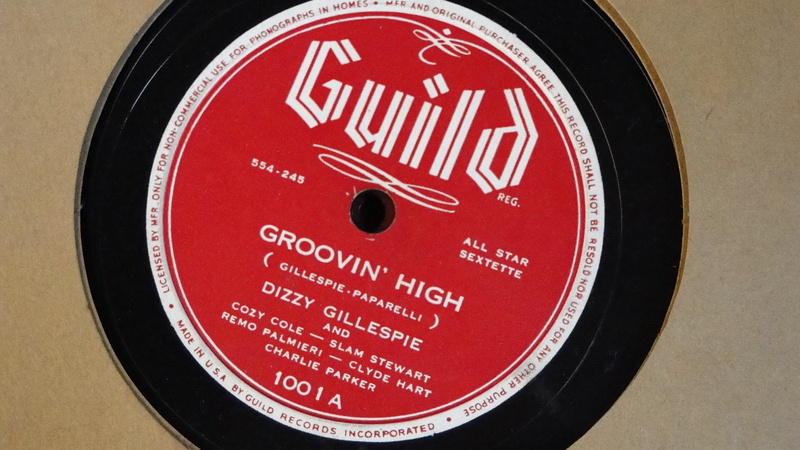 And for those readers who wonder, “What do those records sound like?” I encourage them to search “Kansas City Six” and “A Viper’s Moan” on YouTube, as well as Bird and Dizzy. Reassuringly audible. Posted in "Thanks A Million", Awful Sad, Bliss!, Ideal Places, Irreplaceable, It's A Mystery, Jazz Titans, Pay Attention!, Swing You Cats!, That Was Fun!, The Real Thing, The Things We Love, Wow!